Susan and I visited the farming enterprises in Patagonia Chile, Patagonia, Argentina, Santa Cruz and Chubut Province. The world Merino Congress and Conference in Uruguay. On the stud tours in Uruguay, there would have been 4-500 people attending. 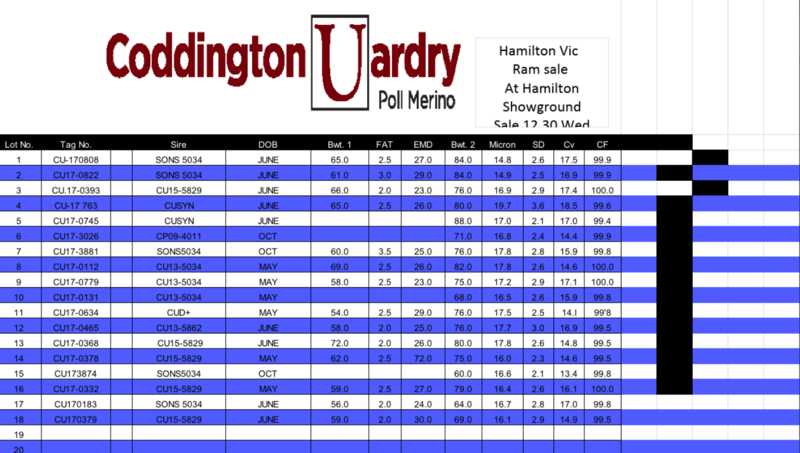 The message at the conference was high demand for wool 18.5 micron and finer, unmulsed, plain bodied, dual purpose merinos. At Coddington Uardry Poll Merinos, our sheep have all these attributes. We started our breeding program to breed this type of sheep in 1999. We ceased mulsing in 2006 and started measuring for muscle and fat since 1999. We have been fleece testing for over 50 years. 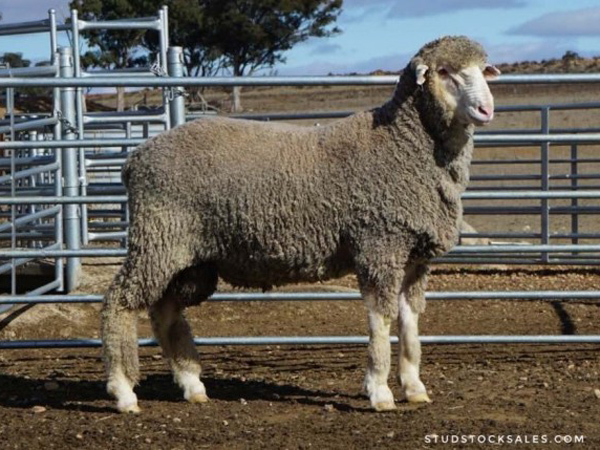 It has always been a Coddington family tradition to breed sheep with high quality, fine to medium wool, long staple and free growing, suited for high rainfall, fleece rot resistant on an animal with a strong constitution. Suited to all environments thought the world were sheep are run. 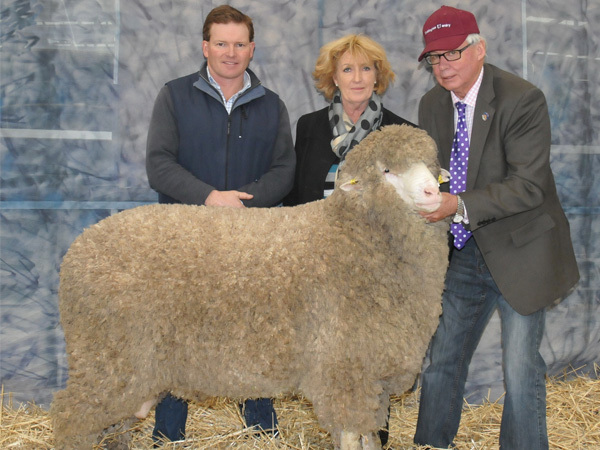 Graham Coddington and Susan Coddington with the buyer of the Champion strong wool poll merino ram sold for $30,000 to Mr Pat Millear, of Stud Park South, Willaura. He paid the top price bidding to $30,000. 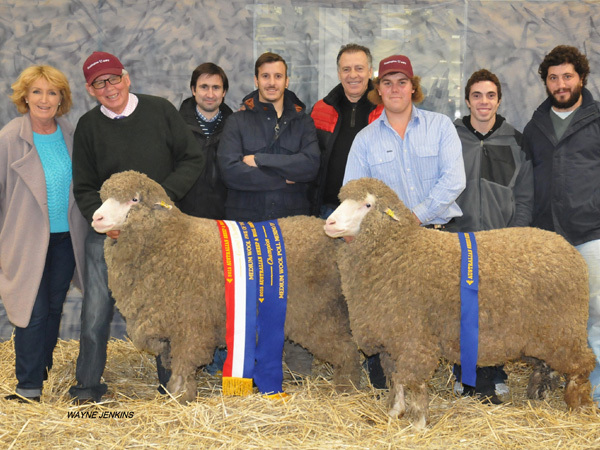 Two ewes sold to an Argentinian syndicate, Indalo Stud, Argentina and one of the ewes made a world record first price of $14,000 ever paid for a ewe the second one being sold for $6,000.